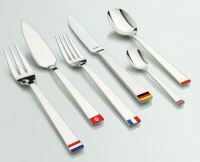 Amefa is a company specializing in the marketing and distribution of cutlery and stainless steel products for both table and kitchen. Amefa’s mission is to be a valued, reliable partner providing the benefits of a global company but with the speed, commitment, flexibility and personal touch of a small company. The Amefa Group has 7 subsidiaries in the Netherlands, the United States, Germany, France, United Kingdom, Poland and Hong Kong which export to different countries worldwide both to hospitality and retail customers.